JERUSALEM - Arsonists torched a mosque in an Arab village in northern Israel Monday, setting off protests by residents who clashed with police. Graffiti sprayed at the site suggested Jewish radicals, suspected in other recent mosque fires, were involved. Police spokesman Micky Rosenfeld said carpet was burned inside the mosque in Tuba-Zangria and interior walls were damaged. Copies of the Quran, the Muslim holy book, were also burned, Israeli media reported. Israel welcomes peace talks, notes "concerns"
The words "price tag" were spray painted on the mosque, Rosenfeld added  a reference to a Jewish settler practice of attacking Palestinians or the Israeli military in retaliation for government operations or attacks against Jewish settlements. Army Radio reported that the family name of a settler and his infant son killed last week in a car crash near the West Bank town of Hebron was scrawled on a wall of the mosque. Israeli police have said Palestinian rock-throwers struck the man in the head, causing him to lose control of the car. An official at the mosque, Ali Zangria, told Army Radio that a villager detected smoke rising from the mosque around 2 a.m. and contacted police. "But everything had already gone up in smoke by then," he said, ruing that his village had been singled out for attack. "The village is a quiet one and we always had good relations with Jewish residents." However, relations between Jews and Arabs in the area have been strained since the chief rabbi in the nearby town of Safed urged followers last year not to rent or sell their homes to Arabs. About 200 villagers from Tuba-Zangria marched toward a major intersection to protest the arson, intending to block the road, Rosenfeld said. Some demonstrators set tires on fire and stoned police officers, who dispersed the crowd with tear gas, he said. No one was injured and no arrests were reported. There was no sign of unrest inside the village. Security was heightened across northern Israel to prevent further disturbances and police met with village leaders in an effort to defuse tensions, Rosenfeld said. Israeli Arabs account for one-fifth of Israel's population of 7.6 million, and many live in northern Israel. The mosque was the third burned since the government destroyed structures in an unauthorized Jewish settlement outpost in the West Bank last month. An Israeli military base was also vandalized after the demolitions and threatening graffiti was sprayed at the apartment of a prominent Israeli settlement opponent. Jewish extremists are suspected in all of these incidents. Prime Minister Benjamin Netanyahu denounced the mosque arson, and ordered the Shin Bet internal security agency to act quickly to locate the assailants. A text message from his office said he "was fuming when he saw the pictures" and said the attack "ran counter to the values of the state of Israel." 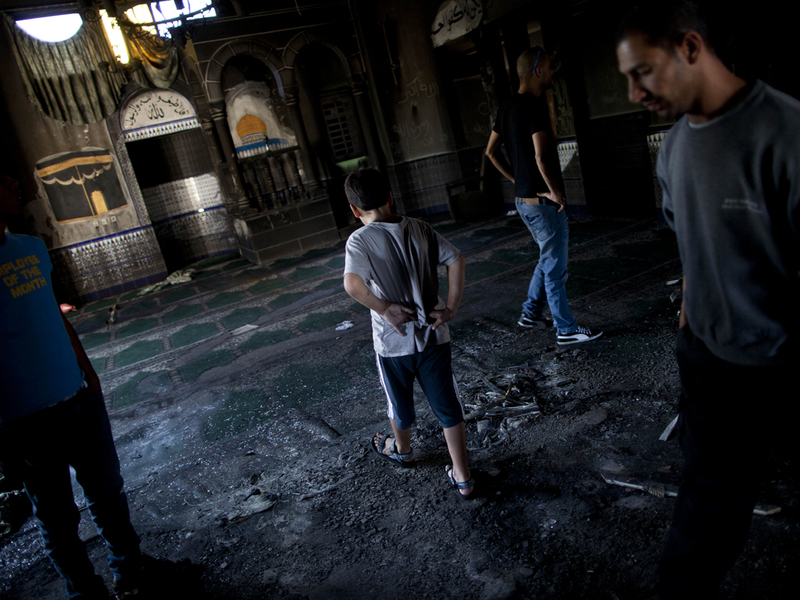 Most "price tag" actions are carried out in the West Bank, and attacks on mosques inside Israel are rarer.